LINCOLN - A 12,000-member nonprofit organization that describes itself as dedicated to protecting, restoring and conserving Maine's environment will be host of a forum on wind power at Mattanawcook Academy late this month, its spokeswoman said Thursday. 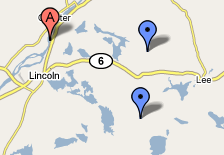 The Natural Resources Council of Maine hasn't yet taken a position on the proposed $130 million Rollins Mountain wind farm slated for ridgelines in Burlington, Lincoln, Lee and Winn, and the advocacy group's record on such facilities is mixed, spokeswoman Judy Berk said. The council supported Rollins Mountain developer First Wind of Massachusetts' Stetson Mountain project, but opposed about half of the Redington Mountain wind project near Sugarloaf, Berk said. "We are generally in support of appropriately sited wind power," Berk said Thursday. The panel discussion is slated for 6 p.m. Wednesday, Jan. 28, at Mattanawcook Academy of Lincoln. It is free and residents are invited. It will feature Mainers who live in communities with wind power, have worked on wind power projects or are small-business owners that have direct experience with wind power development, said Emmie Theberge, a council employee organizing the forum. "I think the forum will have a neutral point of view," Berk said. "It will inform people of what to expect from a wind farm, and how it might affect things like employment, the people in town." First Wind wants to build 40 380-foot turbines, each generating 1.5 megawatts. Project proponents have praised First Wind as a conscientious creator of wind power, saying the Lincoln Lakes project would create as much as 60 megawatts of pollution-free electricity in peak winds. Critics claim the project would threaten human and animal health on Rollins Mountain and would lower land values with light flicker and low-decibel sound while generating only a fraction of its peak capacity. Lincoln's planning appeals board voted 4-2 last week to reject an appeal of a town permit given to the project. A residents group, The Friends of Lincoln Lakes, has said it will take its appeal to Superior Court. The project also must be approved by several state and federal agencies and the three other towns. Those permits are pending. What's your take on Rollins Wind thus far?